U.S. President Barack Obama will visit India later this month. 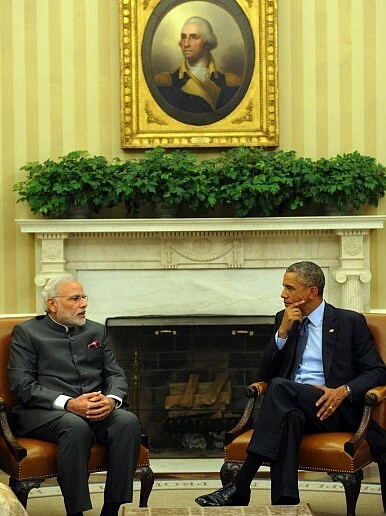 Expectations for the visit are high in both New Delhi and Washington D.C. It would have been hard to have predicted such a positive trajectory in U.S.-India relations a year ago. In December 2013, an already moribund U.S.-India relationship was hit with another jolt as a result of the Devyani Khobragade diplomatic standoff. India reacted angrily to the treatment meted out to a consular diplomat in New York by revoking privileges afforded to U.S. diplomats in India, removing security barricades on the road outside the U.S. embassy in New Delhi and effectively expelling a U.S. diplomat of the same rank as Khobragade from New Delhi. And with the BJP’s Narendra Modi, who was denied a diplomatic visa to the U.S. in 2005, presumed to be the forerunner in India’s May 2014 parliamentary elections, many analysts were predicting a less-than rosy forecast to U.S.-India bilateral ties. Those fears proved to be unfounded. Modi’s approach to foreign policy – described as “nimble” and “pragmatic” — has helped revitalized a sagging relationship with the U.S. In his four-day visit to the U.S. in September 2014, Modi attended and addressed the United Nations General Assembly, met with business and political leaders, addressed a large rally at New York’s historic Madison Square Garden, co-authored an opinion piece in the Washington Post with Obama, and held formal consultations with Obama and members of his administration. An opportunity now exists to move the U.S.-India relationship towards a “new normal,” with closer economic and security cooperation and collaboration. In this regard, it would be wrong to dismiss the importance of Obama’s visit to India and mischaracterize the U.S. president as a lame duck. Indeed, visits to India by second-term U.S. presidents, including Bill Clinton in 2000 (embattled on account of the Lewinsky scandal at the time) and George W Bush in 2006 (unpopular at home due to the Iraq war) were instrumental in providing fillip to the U.S.-India relationship. Modi’s visit to Washington, D.C. came a mere four months after he was sworn in as India’s 15th Prime Minister. While that visit was high on symbolism and helped reenergize the relationship, it did yielded little by way of substance. Obama’s visit to India later this month, then, provides an opportunity for India and the U.S. to demonstrate progress along the contours of India-U.S. joint declaration signed by Obama and Modi. In this regard, it will be significant if the 10-year defense framework agreement can be concluded during Obama’s visit. News reports indicating that the U.S. and India might finalize the sale of RQ-11 “Raven” drones and surveillance modules for the C-130 transport aircraft are encouraging. Obama’s nomination of Ash Carter – who led the U.S.-India Defense Trade and Technology Initiative – as Secretary of Defense will undoubtedly be beneficial in enhancing the bilateral defense relationship. On nuclear energy, it is unlikely that there will be a major breakthrough on supplier-side liability, an impediment in the participation of U.S. companies in India’s civil nuclear industry. India’s Nuclear Liability Act (NLA), 2010 remains incompatible with the IAEA Convention on Supplementary Compensation (CSC), which India undertook a commitment to accede to. Contingent on these incompatibilities, India has signed the CSC but not ratified it, as ratification would require a change in its liability laws. The issues pertaining to supplier-side liability are not U.S.-specific; Russian, Canadian and French companies have also expressed reservations about the NLA. The Modi government must therefore consider available options to make the NLA palatable to India’s current and potential suppliers. To that end, Anupama Sen and Arghya Sengupta offer potential options for India, including creating insurance pools for operators and limiting Section 46 of the Act (which effectively exposes the supplier to other applicable laws in India pertaining to industrial accidents) to allow victims to seek legal recourse only through the provisions of the NLA. The U.S.-India joint statement also called for “joint and concerted efforts” against terrorist groups including al-Qaeda, Lashkar-e-Taiba (LeT), Jaish-e-Mohammed (JeM) and the Haqqani Network. The U.S., for its part, designated the LeT and JeM as terror groups following the December 2001 terrorist attack on the Indian Parliament; it also subsequently proscribed the Jamaat ud-Dawah (the parent organization of the LeT) and announced a bounty of $10 million on its leader, Hafiz Muhammad Saeed. U.S. Secretary of State John Kerry reiterated calls on Pakistan to act against terrorist groups during his visit to Islamabad earlier this month. Such candor from the U.S. – particularly with regard to India-specific terror groups in Pakistan — would not have been likely even 15 years ago. That Indian and U.S. perceptions on terrorism largely converge today bodes well for both countries. Lastly, Obama and Modi must talk Afghanistan. As U.S. and NATO forces continue to withdraw from that country, the new unity government in Kabul will be under pressure in dealing with a range of issues from the raging Taliban insurgency to the country’s fragile economy. So far, Afghan President Ashraf Ghani has been particularly differential towards the Pakistani army’s wishes: he made Pakistan his first port of call as President of Afghanistan, while choosing not to visit India at this time; Ghani has also reportedly suspended the construction of a tank and aircraft refurbishing plant funded by India. These attempts to placate Pakistan are perhaps founded in the belief that the Pakistani army has the ability to influence the Afghan Taliban to negotiate with Kabul. Whether and to what extent the Pakistani army wields influence over the Afghan Taliban such that it can get them to negotiate with Kabul remains to be seen. However, there is no question that Afghanistan’s stability is vital to India’s national interests. Instability in Afghanistan will affect not only India’s infrastructure and exploration projects in that country, but will also impact on India’s domestic security. Few in India have forgotten the hijacking of an Indian Airlines airliner in 1999 to Kandahar that compelled India to release Masood Azhar (who later founded the JeM) in exchange for Indian hostages. The security vacuum of in Afghanistan during the 1990s had direct national security consequences to both the U.S. and India. It is imperative, therefore, that India and the U.S. engage in candid dialog on the future of Afghanistan, including potentially enhancing the nature and extent of Indian security assistance to Afghanistan.